In March 2009, Bolivian president Evo Morales stood before the United Nations, a coca leaf in hand, citing a history of use of the plant for purposes social, spiritual, medicinal, and nutritional. The event marked the beginning of a formal request to correct the “historical error” of the 1961 Single Convention on Narcotic Drugs — the agreement that orders people to stop chewing the leaves and mandates the destruction of all wild coca bushes. Morales, a former coca farmer himself, then put the leaf in his mouth, a gesture that sparked applause from the assembly. Coca chewing has existed in the Andes for thousands of years, and it is practiced by millions of people throughout South America today. The plant’s mild stimulant properties have been known around the globe for centuries. The stimulant, of course, is the alkaloid cocaine, present in trace amounts to the coca chewer, giving users a boost of energy akin to a cup of coffee (which contains caffeine, another alkaloid that is potent in concentrated form). When refined, coca provides raw material for the production of cocaine, and in an effort to limit cultivation of the plant, even traditional usage has been prohibited by this worldwide treaty. Efforts to kill the cocaine trade have violently cracked down on anyone who produces or enjoys the natural, unadulterated leaf. This fact might merely be unfortunate and overzealous – but it is also hugely hypocritical. You see, the Single Convention treaty was adopted after years of negotiations led in great part by Harry J. Anslinger, long-time Commissioner of the US Federal Bureau of Narcotics. Best known today for his fervent campaign against marijuana, Anslinger had a strange relationship with the coca plant: spearheading its prohibition while simultaneously ensuring access to the leaf for a single, powerful consumer, The Coca-Cola Company. 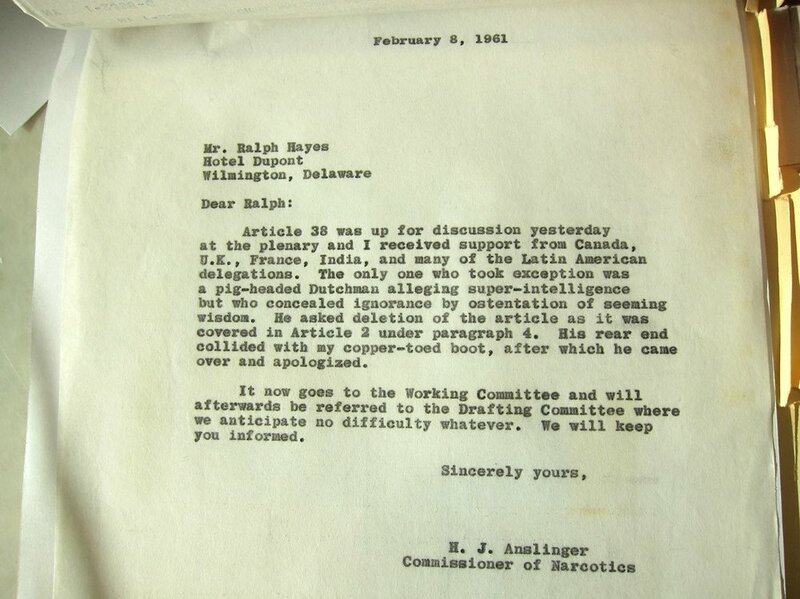 For decades leading up to the signing of the Single Convention, Anslinger worked closely with Ralph Hayes, Vice President of The Coca-Cola Company, to procure coca leaf for the “secret formula” of the popular beverage. Anslinger cooperated with The Coca-Cola Company on legislative phraseology about the coca plant, and was its central ally in negotiations of the Single Convention agreement. As it was finally adopted, in addition to banning traditional use of coca leaves, the treaty contains a provision that allows use of the plant for the special purposes of The Coca-Cola Company. Correspondence between Ralph Hayes, Vice President, The Coca-Cola Company, and Harry J. Anslinger, Commissioner, Federal Bureau of Narcotics. The US chose to impose onerous restrictions on use of natural coca by the people of South America, while simultaneously affording the privilege to a North American corporation making billions off the very same leaf. The Coca-Cola Company is involved in the law against coca. As a longtime coca consumer, it should rather align itself with proponents of the plant in advancing a new understanding: in its native form, coca leaf has been used responsibly throughout human history. After Morales’s 2009 effort to amend the Single Convention treaty, the United States led a coalition to deny Bolivia’s effort. As a result, Bolivia elected to withdraw from the treaty and then rejoin — an odd technicality that would allow the country to include a denouncement of coca prohibition amidst its obligation to the convention. On January 10, 2013, against the objectionsof the United States, Bolivia was granted this small victory. That minimal, largely symbolic step is not enough. The United States should drop its objection to Bolivia’s desire to cultivate a leaf so closely linked with the cultural identity of its people. That, or we should reconsider the legal loophole that allows The Coca-Cola Company to use a plant that is categorically denied to its own native caretakers. This article contains excerpts from the book, A Secret History of Coffee, Coca & Cola by Ricardo Cortés. Subject files of the Bureau of Narcotics and Dangerous Drugs. US National Archives, College Park, MD. H.J. Anslinger Papers, 1835–1970. Accession 1959–0006H, Historical Collections and Labor Archives, Special Collections Library, University Libraries, Pennsylvania State University, University Park, PA.
To learn more, see Part 1: How The Coca Gets in to Coke and Part 3: I Wasn't the First Person to Find the NJ Cocaine Factory.